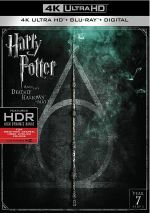 Fantastic Beasts: The Crimes of Grindelwald appears in an aspect ratio of approximately 2.40:1 on this 4K UHD Disc. A project finished 4K, this became a terrific presentation. Sharpness excelled, as no softness materialized. Even in the widest shots, the image remained tight and concise. I saw no jaggies or moiré effects, and neither edge haloes nor print flaws marred the image. As for the palette, it opted for a fairly desaturated bent. Some orange and teal appeared but in an abnormally subdued manner meant to match the period setting. Within those confines, the colors appeared fine, and the disc’s HDR capabilities added vivacity to the brighter tones on display. Blacks were dark and dense, while shadows showed good smoothness. A lot of the movie opted for low-light shots and these came with appropriate definition. Like the colors, the HDR abetted the movie’s contrast and brightness. All in all, the transfer dazzled. 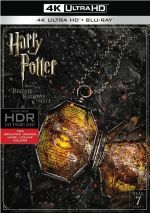 How did the 4K UHD compare to the Blu-ray version? Audio remained identical, as both offered the same Atmos track. Visuals showed impressive improvements, though. The 4K boasted clearly superior sharpness, colors, blacks and contrast. This became an obvious and substantial upgrade over the Blu-ray. All the extras appear on the included Blu-ray copy, and we start with A World Revealed. 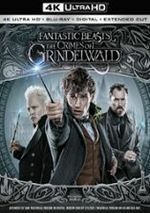 In this 10-minute, 15-second piece, we hear from producer/screenwriter JK Rowling, producer David Heyman and director David Yates. Like the first film in the series, Fantastic Beasts: The Crimes of Grindelwald ends on a fairly exciting note. However, it can be a grind to get to that point, as the movie seems underdeveloped and confusing during too much of acts one and two. The 4K UHD offers excellent picture and audio along with a decent array of bonus materials. Maybe this franchise will come together with Beasts 3, but so far it disappoints, though at least the 4K UHD presents it exceedingly well.